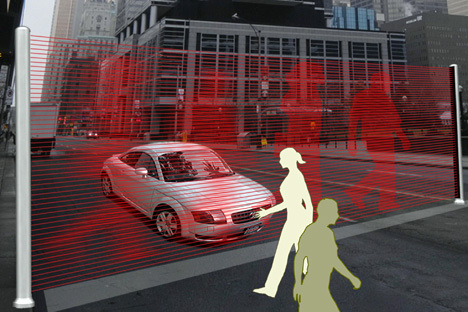 Just in case that whole autonomous robot car thing never actually happens (still crossing our fingers), this concept may help drivers pay attention to pedestrians and avoid mercilessly plowing them down in crosswalks. If those drivers are intimidated by some red laser beams, that is. This idea, from South Korean designer Hanyoung Lee, involves projecting laser images of the pedestrians who are in crosswalks. The goal is to make the pedestrians more noticeable, and to cut down on drivers who run through crosswalks without paying attention to whether they are about to run into one of them. In theory, it sounds like a good idea. What’s not to like about keeping pedestrians safe? But we imagine that having bright red lights running in front of drivers’ field of vision may not be the wisest public safety choice – especially when those lights happen to be lasers. 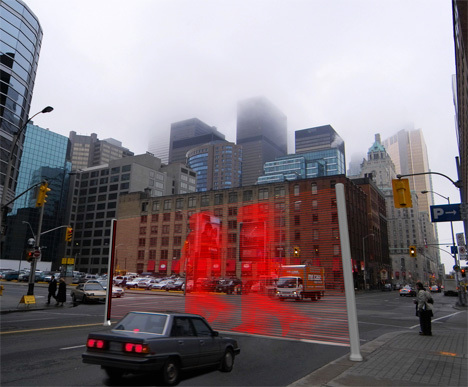 It also stands to reason that the urban landscape would become overly clogged with visual information if this idea were ever realized. But, like we’ve mentioned before, not all designs are meant to be made into reality. Some are a jumping-off point for other ideas which could eventually change the way the world works. 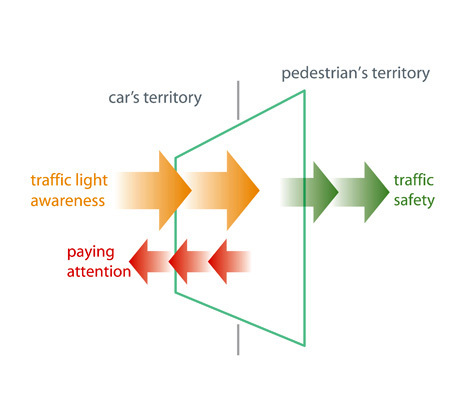 And improving crosswalk safety is a noble cause, so we’re hoping to see more possible crosswalk improvements pop up. See more in Futuristic or under Technology. December, 2009.